* In the 1960s, the Soviet Union developed a jet cargolifter, the "Ilyushin Il-76", for military and civil service. The Il-76 proved a great success; it was the basis for a series of flight refueling tankers, the "Il-78" and "Il-78M", and an airborne warning and control system (AWACS) aircraft, the "A-50". A number of special-purpose variants were also built. This document provides a history and description of the Il-76 and its derivatives. * In 1966, Soviet authorities initiated work on a new four-jet cargolifter aircraft for use with the "Voyenno Trahnsportnaya Aviahtsiya (VTA / Military Transport Aviation)" component of the "Voyenno Vozdoozhnyye Seely (VVS / Red Air Force)" and the Soviet Aeroflot civil airline organization. The new transport was expected to replace the turboprop Antonov An-12; it was specified to have a payload capacity of 40 tonnes (44 tons) and a range of 5,000 kilometers (2,700 NMI), with good rough-field capability. A directive was issued to the Ilyushin OKB (experimental design bureau) for development of the machine, with the work being performed by a team under OKB chief engineer Genrikh Vasilyevich Novozhilov. It is said this was the first Ilyushin aircraft not built directly under the control of OKB founder Sergei Ilyushin; his health was failing, and he would retire in 1970. After consideration of various options, go-ahead for full development of the "Il-76" was given in late 1969. A full-scale, if partial, mockup was built in 1970, with the first prototype built at the OKB's prototype factory in Moscow. Initial flight of the prototype was on 25 March 1971, with test pilot Eduard I. Kuznetsov at the controls. The flight was performed from the secret flight test center at Zukhovskiy near Moscow. The flight lasted an hour, with Kuznetsov giving the machine glowing praise after landing, or so sources say -- usually a new aircraft, even a good one, has some quirks to work out, and contrary to common legend, test pilots don't generally walk out after one flight and praise the machine to the skies. However, it does appear that the Il-76 was a fairly solid machine, since the prototype was flown to France on 25 May 1971 to appear at the Le Bourget Air Show near Paris. The aircraft was described to the press there in a bit of typical Soviet misinformation as a "purely commercial aircraft", intended for air transport to remote and otherwise inaccessible regions, which was maybe half the truth. 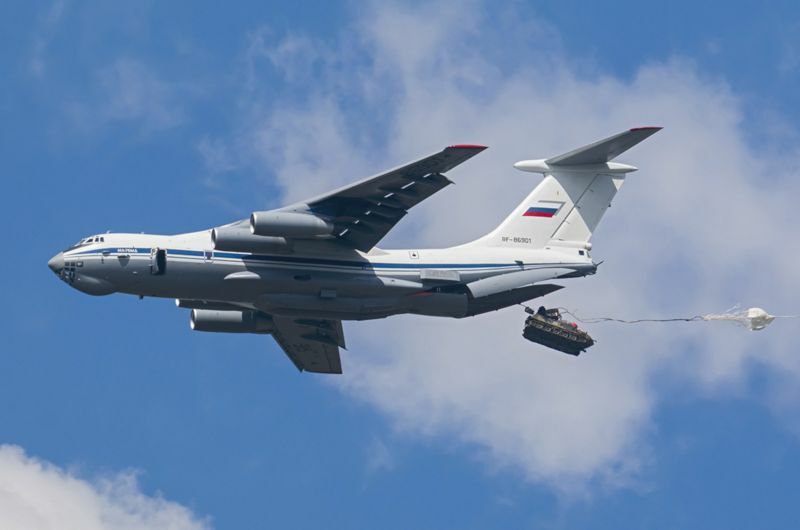 NATO assigned the type the reporting name "Candid", which would become "Candid-A" when another line of Il-76 variants with defensive armament was observed, to be labeled "Candid-B". A static test airframe was then completed, followed by a second flight prototype, which took the air in the spring of 1973, to pay a visit to Le Bourget as well. The story about being a "commercial freighter" was maintained, though some Soviet officials coyly admitted that the aircraft might have "military applications". The two prototypes would be retained as test and trials machines; incidentally, they would help set an impressive array of performance records for the Il-76. Approval for production was granted, with responsibility for production farmed out to State Factory Number 84 in Tashkent, in what is now the independent nation of Uzbekistan. The plant had previously built An-12s and other transport aircraft, but the Il-76 represented a challenge, since it was much more sophisticated than anything built there before. The obstacles were overcome and the initial flight of the first production machine was on 8 May 1973. Service deliveries for operational evaluation began late in 1973, with the Il-76 reaching full service with the VTA in 1975. All production Il-76s would be built in the Tashkent plant. After the first ten production machines were built, the factory switched to an improved "Il-76T" configuration, where "T" stood for "transportniy (transport)". It was externally much the same but had an additional fuel tank in the wing center section and some other small changes. It retained the NATO reporting name of "Candid-A". * The general configuration of the Il-76T was so much along the lines of the earlier US Lockheed C-141 Starlifter military transport that it is hard to believe Ilyushin engineers didn't find the C-141 an interesting source of ideas. Like the Starlifter, the Il-76T featured a high-mounted swept wing with anhedral droop and four turbojets on underwing pylons, plus a high swept tee tail. The main landing gear was stowed in large fairings alongside the fuselage to ensure that the cargo bay remained unobstructed. Cargo was loaded through a rear ramp, with a upward-folding rear door and outward-folding clamshell doors, all of which were hydraulically actuated. However, the Il-76T was clearly not a copy of the C-141. Anybody who built a four-jet high-speed cargolifter was likely to come up with a configuration along such lines, and the resemblance between the two aircraft was no greater that, say, between the Messerchmitt Bf 109 and the P-51 Mustang. The two cargolifters were easily distinguished by anyone who could tell one type of aircraft from another, and the Il-76T had distinctly Soviet features. It was fitted with glazing under the nose for use by a navigator, handy for getting map references and for observing parachute cargo drops. The wing featured high-lift devices to provide short take-off capability. The landing gear was clearly designed for rough-field operation, with the nose gear featuring four wheels in a line-across arrangement, and each main gear assembly featuring two rows of four wheels. The end result of the whole was larger and heavier than the C-141, slightly inferior in payload and range, but much superior in rough-field capability. The wing was fitted with wide-span two-section triple slotted trailing-edge flaps, as well as full-span leading-edge flaps, which were "nocked out" to clear the engine pylons. There was an aileron on each wingtip and eight spoilers on each wing: four spoilers outboard to provide roll control and "lift dumping" on landing, plus four inboard to provide lift dumping. The tail control surfaces were conventional, including rudder and elevators. Leading-edge flight surfaces were de-iced by engine bleed air. The Il-76T was powered by Soloviev D-30KP turbofans providing a maximum thrust of 117.7 kN (12,000 kgp / 26,455 lbf) and fitted with bucket-type thrust reversers; normally only the thrust reversers on the outboard engines were used. The undercarriage also featured hydraulic antilock brakes to reduce landing roll. The nose gear retracted forward and the main gear retracted into the fuselage sponsons, the gear assemblies pivoting 90 degrees so that the axles were parallel to the fuselage, tucked in "sideways" so to speak. The main gear doors were closed after extending the landing gear to prevent them from being filled with mud or other debris in operations off of rough airfields. The tire pressure could be adjusted in flight from 2.5 to 5 atmospheres to deal with different types of airfields. There was a turbine auxiliary power unit (APU) in the left landing gear sponson for engine starting and ground power, with an intake door that was closed in flight to keep the APU from windmilling. The cargo hold had a volume of 321 cubic meters (420 cubic yards). It was fully pressurized and had a titanium floor, with a fold-down roller conveyor system and cargo tie-downs in recesses along the edges. There were four cargo hoists in the roof of the hold to help haul cargoes on board, with the hoists extendable out the rear to allow cargoes to be secured, and then hauled in. The tail ramp could be used as lift as well; there was a hydraulically-operated "leg" on the belly of the aircraft forward of the cargo ramp to prevent the aircraft from tipping backwards when the ramp left the ground. Standard freight modules could be carried. One interesting feature was that the aircraft could be quick-converted to a "jetliner" configuration by fitting a set of three modules in the cargo bay. The modules were based on standard cargo containers; each was 6.1 meters (20 feet) long and 2.4 meters (8 feet) wide and could accommodate 30 passengers, seated four abreast, giving a total passenger load of 120. The modules also provided a galley and a toilet -- it is unclear if only one or all three of the modules had such facilities. A similar three-module scheme was used to convert the aircraft into a flying headquarters / VIP transport. 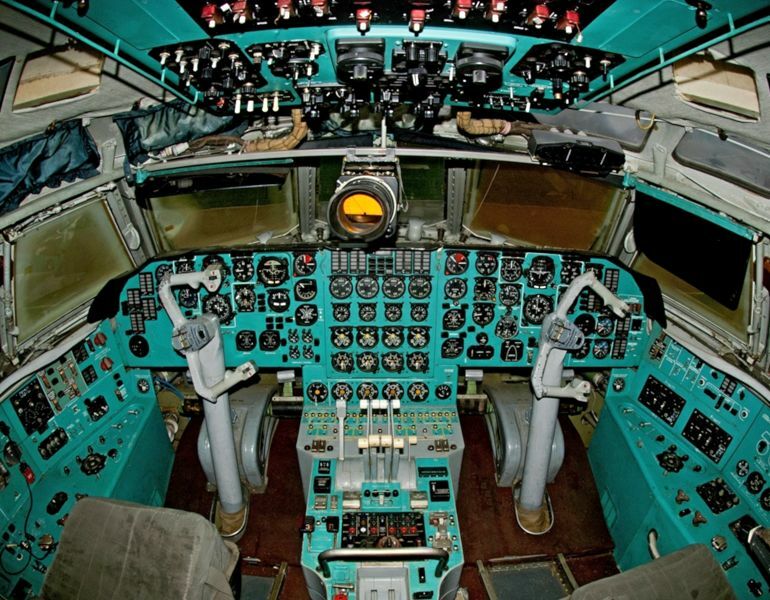 The cockpit featured an analog layout, typical for the time, and photos show it painted in the usual Soviet turquoise "ergonomic" color scheme. The windshield was electrically de-iced. There were crew entry doors on each side of the aircraft parallel to the nose gear, with the doors hydraulically actuated to allow opening in flight, when they could be used as slipstream shields for parachute jumping. There was an emergency exit hatch on each side of the fuselage just parallel with the forward wingroot and behind the wing, giving four hatches, plus an escape hatch on the left side of the nose for the navigator. This hatch was also hydraulically operated to work as a slipstream deflector, the crew diving out down a chute. Apparently nobody trusted this scheme and it was never used for emergency escape, but the chute would turn out handy for stashing contraband. There was also a circular hatch at top behind the cockpit for exit after ditching at sea, and an inflatable life raft stowed behind in the wing-fuselage fairing. There was a prominent radome under the nose for a Koopol navigation radar; since the radome protruded under the bottom line of the fuselage to provide coverage to the rear, a special nose-gear tow bar with a kink in it had to be implemented. There was also a weather radar in the upper nose. The Il-76T was followed in production in the early 1980s by the "Il-76TD", the suffix standing for "transportniy dahlniy (long-range transport)". The Il-76TD featured uprated Soloviev D-30KP-2 engines providing 122.6 kN (12,500 kgp / 27,560 lbf) thrust. It also had enlarged fuel tanks, airframe reinforcements to handle higher take-off weights, and various small changes. It retained the "Candid-A" reporting name. * The Il-76/T/TD were labeled as "civil" machines, though in practice they often flew in military service, and in fact Aeroflot was clearly on the tail end of deliveries. As mentioned, a parallel sequence of strictly military "Candid-B" machines with defensive armament was built as well, with the parallel nature of the production emphasized by the fact that the second production machine was built to military configuration. This machine was rolled out in October 1973 and designated the "Il-76M", with the "M" indicating the military nature of the variant. The defensive armament consisted of a prominent UKU-9K-502-1 manned tail turret, where "UKU" stood for "unifitseerovannaya kormovaya ustanovka" or "standardized tail installation". This designation was derived from the fact that exactly the same tail turret was fitted to the Tupolev Tu-95MS "Bear" and Tu-22M "Backfire" bombers. The turret's "sting" consisted of twin Gryazev-Shipoonov GSh-23 two-barreled 23-millimeter cannon. The GSh-23 was an ingenious weapon, the two barrels of each cannon being arranged in a "teeter-totter" fashion so that the firing of one barrel hinged the other barrel forward to be loaded and fired in turn. The effect was a very high rate of fire, with a cyclic rate of 3,600 rounds per minute. A PRS-4 Krypton fire-control radar was fitted under the rudder to guide the cannon. Although such defensive armament might have seemed futile, with a fighter armed with air-to-air missiles (AAMs) able to easily stand off out of range and blow the big transport out of the sky, the cannon also amounted to a countermeasures system, since it could fire chaff and flare rounds to confuse AAMs. The gunner sat in his own pressurized compartment, generally entering through a door in the rear cargo bay bulkhead. If he needed to bail out, there was a hydraulically-operated escape hatch on the right side. Unlike the Candid-A machines, the Candid-B machines were equipped for troop transport and paratroop dropping, with a row of fold-down seats along each side of the cargo bay. A double row of seats could also be easily installed down the center of the cargo bay, and for troop transport an upper deck with seats could be installed as well. Up to 140 troops or 125 paratroops could be carried. For paradrops, the cargo bay was depressurized while the cockpit remained pressurized; the jump alarm system was so loud and obnoxious that paratroopers said they were eager to jump out. The jumpmaster could observe operations through the nose glazing. The Il-76M could also be fitted for carriage of stretchers and medical attendants, though this was rarely done. Some later production Il-76Ms had a defensive countermeasures system, apparently a radar-warning system, with six antennas in small blister fairings arranged around the aircraft to give 360 degree coverage. Some Il-76Ms were also fitted with an inert gas generator that pressurized the fuel tanks, reducing the risk of an explosion. * The Il-76M was followed by the "Il-76MD", the suffix meaning "military long range"; aside from the tail turret, it was generally similar to the Il-76TD, with the uprated D-30KP-2 turbofans. The Il-76MD had provisions for fitting defensive chaff-flare dispensers to the rear fuselage. Two stores pylons could be fitted to each outer wing, for a total of four pylons, each of which could handle a 500 kilogram (1,100 pound) load. The pylons were rarely attached; it was troublesome to fit them, since they were heavy and had to be held up by ground crewmen standing on ladders. Il-76 crews occasionally performed practice drops of leaflet canisters, but that's about as much use as was ever made of the pylons. Demilitarized Il-76M/MDs, with the tail guns and other combat-related gear yanked, sometimes ended up in commercial service. Oddly, some Il-76T/TDs were observed with markings identifying them as Il-76M/MDs despite the lack of a tail turret, while some Il-76M/MDs were observed similarly marked as Il-76T/TDs despite being fitted with the tail turret. These machines are sometimes referred to as "Falsies". Il-76 export users included Algeria, Cuba, China, India, Iraq, Libya, North Korea, and Syria. Most users only obtained a handful of aircraft, but India and Libya obtained 24 each, and Iraq was the big export user, with at least 38 delivered. The Indian Air Force (IAF) gave their Il-76MDs the colorful name of "Gajraj (King Elephant)". * Once in service, the Il-76 was put into regular use for airlift of supplies for the Red military around the Soviet "empire", often flying to bases in Eastern Europe and elsewhere. The first major foreign campaign was in late 1977, when Aeroflot-marked VTA Il-76s performed an airlift to assist the Ethiopian government in its civil war with separatists in the Ogaden and Eritrian provinces. The Il-76 was one of the backbones of Soviet airlift during the war in Afghanistan in the 1980s. It was a difficult mission from the start, the initial problem being the fact that the Afghan terrain was so high and rugged. On the day of the Soviet invasion, 25 December 1979, an Il-76M flew into a mountain, with all crew lost. Things got worse once the Mujahedin, the Afghan guerrilla movement, got their hands on "man-portable air defense (MANPAD)" missiles. On 26 November 1984, an Il-76M was hit by a captured Strela-3 (NATO SA-7 Grail) MANPAD, setting off an explosion that ripped the aircraft apart in mid-air. The Strela-3 was not generally regarded as a very effective weapon, but in this case the results were all that the Mujahedin might have hoped for. Il-76 flights into Afghanistan were then suspended for about a year and half to figure out how to respond, the conclusion being to fit Il-76s operating in the theater with twin APP-50 chaff-flare dispensers. The original fit was inside the rear of the main landing gear sponsons, but the definitive fit was to scab a dispenser on each side of the rear fuselage. A automated dispensing system was fitted to some Il-76s to dump chaff and flares on a missile launch alarm, but the system had a high false alarm rate and was not adopted for general service. The general procedure was for the tail gunner to keep a watch out and manually activate the dispensers if a missile were launched. New tactics were evolved, with Il-76s landing and taking off in a tight, steep spiral to make them more difficult targets. This procedure caused high levels of airframe stress, and so the aircraft were often patched with aluminum plates. Mil-26 Hind helicopter gunships guarded the base perimeter to keep Mujahedin armed with MANPADs from sneaking in close, and the gunship crews were also ordered to soak up MANPADs to keep them from hitting a transport. By that time, the Mujahedin were being equipped by the US with the Stinger MANPAD missile, which was much more effective than the Strela-3; every now and then a Hind had to take a Stinger hit. Soviet forces left Afghanistan in early 1989, but the Soviet-backed government managed to hang on until 1992, and in the meantime Il-76s continued to fly into the country. An Il-76MD was lost on 27 March 1990 on approach into Kabul, though the problem was clearly pilot error, not hostile action. On 6 June 1990, an Il-76MD loaded with fuel was hit by a Stinger; the pilot made a wheels-up landing, but the aircraft was a write-off. In the last days of the Soviet-backed government, Il-76s were used to pull out Soviet personnel, with an Il-76MD destroyed on the ground by artillery on 28 August 1992. The crew survived, to be snatched up by another Il-76MD that managed to get off the runway with its mainwheel tires shot to pieces. The aircraft that was destroyed in the incident seems to have been unlucky; in the summer of 1988, it had been hit by a Stinger while flying an airlift mission in support of the pro-Soviet government of Angola in Africa, losing an engine but landing safely. 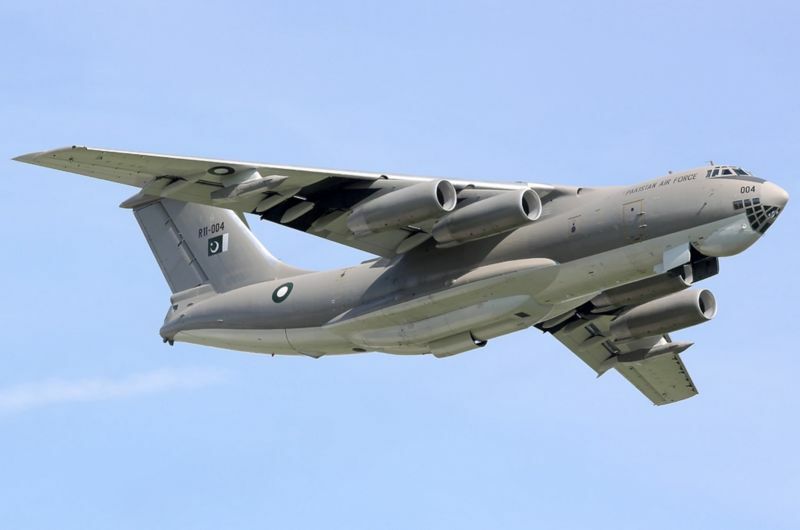 * Even the replacement of the Soviet-backed government and the rise of the Muslim-fundamentalist Taliban didn't quite end the adventures of the Il-76 in Afghanistan. On 3 August 1995, a MiG-19S fighter operated by the Taliban government intercepted an Il-76TD operated by the Russian airline Airstan and forced it to land in Kandahar. Taliban officials were annoyed at Russian backing of anti-Taliban Afghan forces, and wanted to use the crew as hostages for the return of Taliban members believed to be held by the Russians. The Russian government negotiated, to no effect; a scheme to perform a commando raid to free the hostages was dismissed as impractical. However, the crew proved resourceful enough to rescue themselves. They managed to talk their captors into giving them access to the Il-76TD in order to keep it in flightworthy condition, and on 16 August 1996, after over a year in captivity, they made a run for it, taking off with three of their guards along with them, and flying at low level to Iran with a huge cloud of dust in the aircraft's wake. Fighters were scrambled to intercept, but the pilots assumed that the aircraft was heading north to Russia, and failed to stop the escape. * The Il-76 was seeing action in various ways elsewhere. On 23 September 1980, just after the start of the Iran-Iraq War, an Iraqi Il-76 in civil colors was coming into Baghdad just at the very time Iranian McDonnell F-4 Phantoms happened to pass through on a raid. The Il-76 was a tempting target and was promptly shot down, crashing just beyond the airport runway. During the 1980s, the US Reagan Administration had a protracted feud with Libyan dictator Mohamar Qaddafi, which reached a peak in early 1986 when Libyan agents were implicated in a plot to bomb a disco club in Berlin that killed a US soldier. On 15 April 1986, the Americans conducted a large-scale air strike against Libya codenamed Operation EL DORADO CANYON. One of the victims was a Libyan Arab Airlines Il-76T that was caught on the ground, with witnesses saying the aircraft ended up so full of holes that it looked like a sieve. The Il-76 was only a small part of the destruction; Qaddafi was suitably intimidated. * The Il-76 was a witness to the post-Cold War world, helping withdraw Russian forces from Eastern Europe in the early 1990s. During the troubles in what was once Yugoslavia, Russian and Ukrainian Il-76s, often painted in white United Nations colors, often flew into Sarajevo on humanitarian flights. One overshot the runway on 31 December 1994, suffering some damage but with no harm to the crew; sniper activity made recovery of the aircraft impossible, and it was abandoned. Il-76s have also been used on humanitarian missions in Africa. The Il-76 has a good safety record, but has been in its share of accidents. On 12 December 1995, an Il-76MD operating in support of the Rooskiye Vityazi (Russian Knights) flight demonstration team was leading the team's Sukhoi Su-27s back from a tour in Malaysia, with a stop planned at Cam Ranh Bay in Vietnam, an American-built facility that the Russians had taken over. The landing system at the airfield there was in poor shape and the sky was socked in; the Il-76MD came in too low, and though the pilot caught the error and pulled up, three Su-27s flew into the ground. The Il-76MD pilot was court-martialed and sentenced to six years in prison, but was granted amnesty because of his good past service record. In one of the worst accidents in aviation history, on 12 November 1996 a Kazakhstan Airlines Il-76TD collided with a Saudi Arabian Airlines Boeing 747 jumbo jet on approach to New Delhi. All 39 on board the Il-76TD were killed; astoundingly, two of the 312 on the 747 survived. * By the time of the fall of the USSR, about 700 Il-76s had been built. 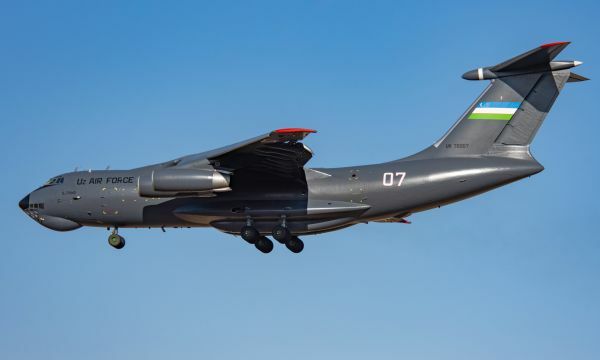 The type continues to be produced in Tashkent, and remains in extensive service in Russia, former Soviet republics, India, and elsewhere -- with Iran acquiring a small fleet when Iraqi Il-76s were impounded after a mass "defection" of Iraqi Air Force aircraft during the Gulf War. In fact, an improved version, the "Il-76MF", was promoted after the fall of the USSR. The US Air Force had found that their C-141A Starlifter often ran out of storage volume before it ran out of lift capacity, and so Lockheed developed the stretched C-141B upgrade to permit more cargo volume. Plans were similarly made for a stretched Il-76 early in its development program, but such schemes faltered on the non-availability of an engine adequate to lift the heavier airframe: the D-30KP series had simply run out of steam for further uprating. In the 1980s, however, the Soloviev OKB developed a next-generation turbofan, the PS-90 series, for the Tupolev Tu-204 twinjet airliner. In the 1990s, the stretched Il-76 concept was revived, with the aircraft to use the improved Soloviev engines. A model was exhibited at the Moscow AeroShow in 1992, with the initial prototype performing its first flight on 1 August 1995, with test pilot Anatoliy V. Knyshov at the controls. The Il-76MF featured a 3.3-meter (10 foot 9 inch) fuselage plug installed fore and aft of the wings, giving a total stretch of 6.6 meters. The stretch meant higher capacity for troopship operations, so the number of emergency exits on each side of the fuselage was increased from two to four. The four PS-90A turbofans provided 157 kN (16,000 kgp / 35280 lbf) thrust each; they were not only about 28% more powerful than the D-30KP-2 turbofans they replaced, but had 15% better specific fuel consumption, lower noise, and lower emissions. They also featured cowling thrust reversers instead of the bucket reversers of the D-30KP series. Maximum payload weight went from 40 to 60 tonnes, demanding wing reinforcement. The wing configuration was otherwise not changed, and there was no major revision to the landing gear either. Avionics were upgraded overall, including a "glass cockpit" with color flat-panel displays, an upgraded Koopol-3 navigation radar, and new communications gear. A new TA-12-60 APU was fitted as well. Although the "MF" suffix suggested a military transport, there was no tail turret. There were reliability problems with the PS-90A engines at first, requiring them to be derated for a time, but the troubles were resolved. Although the VVS evaluated and formally adopted the Il-76MF, the first production machine wasn't flown until 2010. The initial two were slated for delivery to Jordan, which had purchased them in 2005. The Russian Air Force is very reliant on the Il-76MD and wants to keep their machines in service, with an upgrade program in the works to refit the existing machines with PS-90A-76 engines, a new wing, stronger landing gear, and the improved avionics of the Il-76MF. A modern defensive countermeasures system is also in the upgrade, but it is unclear if all the updated aircraft will be fitted with it. The upgraded machines were originally given the designation of "Il-476", but that was changed to "Il-76MD-90A". The first modernized machine was displayed to the public in late 2011, followed by initial flight in 2012, initial flight of a "production" machine at the end of 2014, and first deliveries of the type to the VVS in late 2015. The Il-76MD-90A increases payload by 20% and range by 25%. A civilianized version, the "Il-76-90A", is also being offered. * There were a number of specialized Il-76 subvariants. In the 1980s, four Il-76MDs were modified to a specialized "stand-off jammer" configuration, designated the "Il-76PP", where "PP" stood for "postanovschchik pomekh" or "ECM aircraft". They carries the Landysh (Lily) countermeasures system, being decorated with blade antennas, small antenna fairings, wingtip antenna pods, and two oversized "cheek" fairings forward of and merging into the landing gear sponsons. Each cheek fairing contained an Ivchenko Al-24VT auxiliary power turbine to drive the Landysh system, with each APU providing 2,100 kW (2,820 SHP) and turning four electrical generators. The IL-76's original APU had to be moved back in the left landing gear sponson and fed by an "elephant ear" intake. The main passenger doors were modified to fit around the cheek fairings, and the forward emergency exits were deleted. A cooling system drew in air from inlets on the front of the landing gear sponsons, with the air exiting through an exhaust in the cargo bay doors. The Beriev OKB performed the modifications. These aircraft were referred to as "Chipmunks" because of the cheek fairings. The concept was not successful, the Landysh system being unreliable as well as a power hog, and the platform suffered from electromagnetic compatibility problems -- always an issue with a high-powered jammer system, since such things have a nasty tendency to jam themselves. Although the Chipmunks were extensively evaluated, they never went into service. * Two Il-76s were built in the mid-1980s as flying command post / communications relay aircraft and designated "Il-76VKP", where "VKP" stood for "vozdooshniy komanndniy poonkt (airborne command post)". The nose glazing was faired over, and a long "canoe" fairing for a satellite communications antenna was fitted over the top of the aircraft from the cockpit back to the wing fairing. Various antennas littered the fuselage, including a large blade antenna on each side of the tail. The forward section of the main gear sponsons was swollen, and a long antenna could be spooled out from the aircraft to perform very low frequency (VLF) communications with Soviet ballistic missile submarines. The Il-76VKPs were clearly the Soviet answer to the US "Take Command And Move Out (TACAMO)" aircraft, intended to support Soviet strategic nuclear forces in a crisis. * Beginning in the late 1970s, a total of five Il-76s was converted for use as engine testbeds. They were designated "Il-76LL", the "LL" standing for "letauschchaya laboritoriya (flying laboratory)" -- a suffix commonly given to Soviet test and trials machines. They were fitted with engineering workstations and a modified electrical system to provide power for the test gear, and generally had twin heat exchangers on the left fuselage behind the wing. In most pictures of Il-76LLs, the engine under test was mounted on the left inboard engine pylon. The Il-76LLs tested a wide range of engines, including turboprops, propfans, and turbofans, such as the big Lotarev D-18T high-bypass turbofan. A number of Il-76s were used as avionics testbeds, but these were mostly involved in secret military projects, and not much is known about them; in fact, it's hard to determine if they were actually given the designation of "Il-76LL". One was used as a testbed for a side-looking radar system, featuring distinctive antenna fairings on the fuselage forward of the wing, first flying in 1988. It also had other systems, including an infrared scanner, and was sometimes used for land surveys. Other Il-76s were used to test electronic intelligence (ELINT) gear or systems for the A-50 "Mainstay" AWACS, described below. One of the most distinctive, if highly secret, of the Il-76 testbeds was the "A-60", a testbed for an airborne laser system developed in response to the US "Star Wars" missile-defense effort of the 1980s. The A-60 was developed in conjunction with the Beriev OKB and featured a prominent nose radome, clearly for a targeting radar system; a pop-up turret on the rear spine for the laser; and big "cheek" fairings like those of the Il-76PP standoff jammer aircraft for auxiliary power turbines, clearly to power the laser. As mentioned, the Il-76M/MD could be configured to carry stretchers and medical attendants, but that was rarely done. However, the war in Afghanistan led to a need to get critically wounded troops back to the USSR, a task somewhat beyond the capabilities of a stretcher carrier, and so two Il-76MDs were modified as "flying hospitals". Once again, this was implemented using three modules based on a standard cargo container, with one module for surgery, another for intensive care, and the third for stretchers. The two aircraft were given the designation of "Il-76MD Scalpel-MT"; at least one Il-76TD was converted to a similar configuration for civilian use and designated "Il-76TD-S". As with the United States, the Soviets needed an aircraft to help train spacefarers in zero-gravity operations, with the aircraft climbing and then dropping to put everything into "free fall". The early Soviet "vomit comets", as such aircraft are sometimes called, were all jetliners, but in 1981 an Il-76M was produced with a padded bay for cosmonaut training, and also had facilities for carrying heavy space payloads to see how they responded to zero gee. The aircraft was called the "Il-76K", where the "K" essentially stood for "cosmonaut". From 1987, several more Il-76s were built or converted to a vomit comet configuration with airframe reinforcements, with these machines designated "Il-76MDK-II". The "MD" code suggested they were derived from Il-76MD military cargolifters, but they lacked tail turrets, making them "Falsies". A special cargo-bay module was designed in the late 1980s to convert any stock Il-76 into a wildfire bomber. The module consisted of two tanks that vented over the open cargo bay door, and could accommodate up to 40 tonnes (44 tons) of water. Aircraft fitted with the module were designated "Il-76P", where "P" stands for "pozhahrniy (fire fighter)", but the module was designed to be easily installed or removed, and there were otherwise few or no changes to the airframe. A number of Il-76Ps are currently in use in Russia. Trials were performed in the late 1980s with two Il-76s for use as search and rescue aircraft, with the machines paradropping a lifeboat to survivors. They were designated "Il-76PS", where "PS" stood for "poiskovo spahsatelniy (search & rescue)." The decision was made that existing assets could do the job, and the program was abandoned. After the big Tupolev Tu-160 "Blackjack" bomber was introduced, the bomber's tailplane proved to be structurally inadequate, in some cases shedding pieces in flight. A new tailplane was designed; since it was really big, there was a problem in delivering it to operational bases for installation on Tu-160s. An Il-76MD was modified to do the job, with the tailplane carried on struts on the back of the aircraft behind the wing. This machine was called the "Triplane". A number of variants were considered but not built, including a drone carrier and controller platform; and a space launch booster carrier, with the booster carried on a dorsal rack. * The Soviets had problems getting organized on inflight refueling. It doesn't appear to have been generally that big of a technical challenge, the difficulties being mostly due to the fact that they had less strategic need for inflight refueling, and other priorities kept bumping acquisition of a tanker fleet down the queue. The VVS did acquire numbers of Tupolev Tu-16N "Badger" and Myasischchev 3MS2/3MN2 "Bison" tankers in the 1960s, but these aircraft were only capable of single-point refueling, and by the 1970s something a bit more capable was clearly required. There were plans early on to use the Il-76 as a tanker, but the initial versions didn't have the lift capacity to do the job. The development of the uprated Il-76MD made a tanker variant more attractive, leading to authorization of a development program. The sole "Il-78" tanker prototype performed its initial flight on 26 June 1983, with OKB test pilot V.S. Belousov at the controls. The variant proved satisfactory, leading to introduction to VVS service in 1987. The type was given the NATO reporting name of "Midas". The Il-78 tanker featured three hose-drum units (HDUs), with one under each wing and one on a stub pylon on the left side of the tail. The HDUs were built by the Zvezda organization and designated "UPAZ-1", where "UPAZ" stood for "unifitseerovanniy podvesnoy agregaht zahprahvki" or "standard suspended [external] refueling unit". The UPAZ-1 was basically a stock item that could also be carried by tactical aircraft for buddy tanker operations. Each HDU was in the form of a square-section pod with a conical nose. The nose cone retracted inward to admit airflow to drive a ram-air turbine for the fuel pump, and there were red-green-yellow "traffic lights" on the rear of the pod to communicate with pilots of client aircraft. The HDUs had a high fuel flow rate of 2,500 liters per minute (660 US gallons per minute). The HDUs could be easily detached, and Il-78s have been observed with the wing HDUs removed. The tail HDU installation looked like a clear improvisation, but it permitted installation of a centerline refueling point without demanding major structural changes to the aircraft. Early production featured the centerline pod mounted directly on the rear stub wing, but later production featured the pod hung off a pylon beneath the stub wing -- apparently to reduce the effects of turbulence on the refueling hose. Although the UPAZ-1 HDUs could draw fuel from the aircraft's fuel system, two large fuel tanks could be pallet-mounted inside the aircraft's cargo bay to support tanker operations. A fuel dump system was fitted to the aircraft to allow the tanks to be drained in case of an emergency. The cargo-bay fuel tanks could be pulled to allow the aircraft to be used in the transport role. While the HDUs were controlled from the cockpit by the flight engineer, the tail cannon position was used as an observing post, with another "traffic light" array on the back of the turret where the cannon used to be, plus periscopes under the position staring forward to allow the observer to keep an eye on the HDUs. The aircraft was fitted with a transponder to help clients find it. The Il-78 was followed by a dedicated tanker variant, the "Il-78M", which could not be used as cargolifter. The Il-78M had three cargo-bay fuel tanks instead of two, and the rear cargo doors were replaced by a fixed fairing. All had the stub wing / pylon mounting scheme for the centerline HDU. The Il-78M retained the "Midas" NATO reporting name, though some sources have identified the Il-78 as the "Midas-A" and the Il-78M as the "Midas-B". The Russians are now obtaining the "Il-78M-09A", with PS-09A-76 turbofans, and the other changes for the Il-76MD-90A. Initial flight was in early 2018, with the VKS planning to obtain 34 new-build machines. * The Il-78/78M remains an important asset in Russian service. None were exported as such, but the Iraqis modified a single Candid-B to a tanker configuration late in the 1980s, with a single HDU fitted to a pylon hanging through the centerline of the cargo doors. The HDU was a Douglas unit that had been supplied by the French for carriage by Iraqi Mirage F1s. This machine was a clear improvisation; its ultimate fate is unknown. 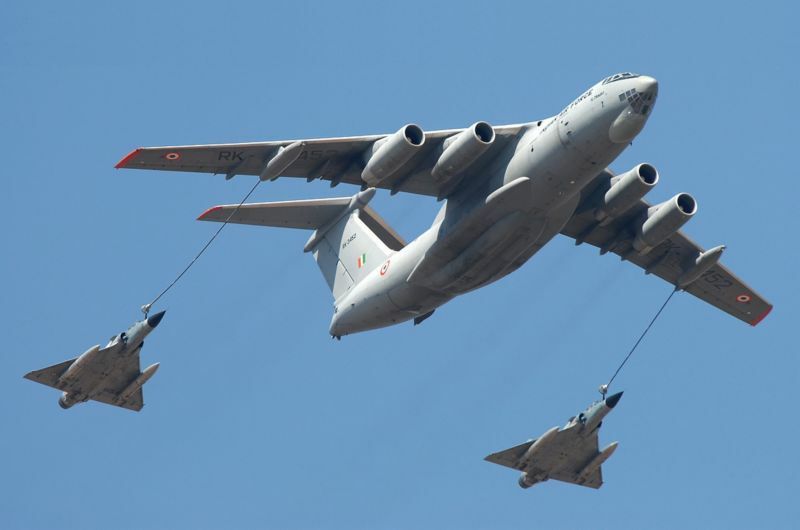 The Indian Air Force (IAF) has obtained an Il-76-based tanker fleet, the aircraft being designated "Il-78MKI", with the first obtained in 2003. They weren't stock Il-78 or 78M machines; they were originally Il-76s obtained from Uzbekistan and refurbished, then being fitted with Israeli tanker modules and French avionics. They have been used to support IAF exercises as far afield as Alaska. * As with tankers, the Soviets were laggards in adopting "airborne warning and control system (AWACS)" aircraft -- platforms carrying wide-area surveillance radar and other electronics gear to detect enemy aircraft and other assets, then vector combat assets against them. In the 1960s the USSR fielded an AWACS aircraft, the "Tu-126 Moss", based on the Tu-114 four-turboprop airliner, itself based on the "Tu-95 Bear" bomber. In the 1970s, the Soviets began development of an improved AWACS based on the Il-76. The result, the "A-50", was apparently introduced to service in 1984. It was developed in cooperation with the Beriev organization. It was assigned the NATO reporting name of "Mainstay". The A-50 was organized around the Shmel (Bumblebee) surveillance system, the core of which was a pulse-Doppler radar with a rotating antenna dome on the back behind the wings, called a "pogahnka (toadstool)" by crews. The Shmel system also included identification friend or foe (IFF) capabilities and a number of color workstations, with datalinks, including satellite links, providing communications with fighters and other assets, and a mission computer coordinating the whole. The aircraft was littered with other antennas, most prominently in the form of an antenna fairing on the back just forward of the wings, and a finlike antenna on the rear of each landing gear fairing. The nose glazing of the Il-76 was deleted, replaced with an extended antenna fairing under the nose, and a single small window on each side; the tail turret structure was retained, but used to accommodate electronic systems instead of cannon. The A-50 was fitted with an inflight refueling probe, but reports indicate that the interaction of the slipstream of a tanker with the A-50's radome created such nasty buffeting that inflight refueling demanded special pilot qualification. The A-50's Shmel radar is not in the same league as that of its Western counterpart, the Boeing E-3 Sentry, lacking the same range or ability to track as many targets simultaneously; the Russians do claim the system had good "look down" capability, able to pick out low-flying targets in "ground clutter". Exercises demonstrated the ability of the A-50 to direct MiG-31 "Foxhound" interceptors, Tu-22M-3 "Backfire" bombers, and submarines simultaneously. Along with the flight crew, the A-50 carries ten systems operators. The avionics kit is heavy -- the Soviets were generally competitive with the West in terms of airframe design, but their electronics capabilities were distinctly inferior -- and apparently the A-50 suffered badly from weight growth during its development. Its aircrew facilities are said to be cramped, noisy, and lacking in amenities, one particularly troublesome omission being no relief-crew bunks. The old Tu-126 Moss, derived from a large airliner, was much more comfortable, and an A-50 apparently has not been a desired crew assignment. During the 1991 Gulf War, two A-50s were kept on station over the Black Sea to observe Coalition air activities over Turkey and northern Iraq. The A-50 remains in service, with aircraft now undergoing an upgrade program to receive modernized systems, the upgraded aircraft being redesignated "A-50U". 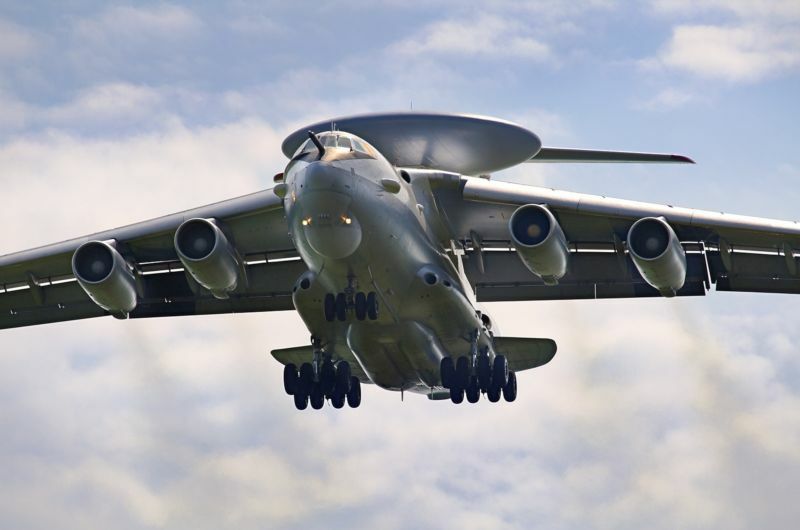 Beriev is developing a next-generation AWACS, based on the Il-76MD-90A, designated "A-100". Initial flight was on 18 November 2017. Configuration is much like that of the A-50 -- but along with the new airframe, it features the "Premier" mission system, built around a search radar, with a mechanically rotated antenna featuring active-array elements for vertical scan. It is said to be able to track up to 300 ground or air targets simultaneously. Deliveries to the Russian Air Force are to begin in 2020. * The Soviets developed another Il-76 variant that looked something like the A-50, but was intended for an entirely different mission. The Soviets had long used modified Ilyushin Il-18 turboprops rigged with electronic gear to monitor telemetry from missile and space launches. When these machines were finally retired, two Candid-Bs were converted to a similar configuration, with an antenna dome on the tail and various antennas littered over the airframe. These machines were simply known as "Aircraft 676" and "Aircraft 776". Following this exercise, the Soviets decided to modify five Il-76MDs to a more capable tracking and telemetry configuration, also with a litter of antennas, but this time including the "toadstool" radome. These machines were designated "Aircraft 976", or "SKIP" for "samolyotniy komahndno ismereetelniy poonkt (airborne measurement & control station)". They were also referred to as "Il-76SK", "Il-976", or "Be-976", the Beriev OKB having been involved in the conversion. Although some sources incorrectly identified the Aircraft 976 aircraft as AWACS platforms, the similarity of these machines to the A-50 was somewhat superficial, effectively limited to the toadstool radome. They had nose glazing, cargo doors, and a tail turret station, though the cannon were yanked and replaced with an antenna fairing. They were fitted with wingtip pods, like those of the Il-76PP Chipmunks, and also with a set of L-shaped antennas on each side of the tailfin. They did not have the vent in the tailfin extension. They appeared in Aeroflot colors, though they were clearly not civil machines. * The Iraqis modified a few Il-76s to AWACS configurations in the 1980s. The first was the "Baghdad-1", which was a clear improvisation, with a French Thomson-CSF Tigre surveillance radar installed in the cargo bay of a Candid-A and the radar antenna fitted in a fixed composite radome replacing the cargo doors. It was use operationally late in the Iran-Iraq War. There's no information on how well it worked, but it was dubious in appearance. The second was the "Baghdad-2", which had the Tigre radar in a conventional dorsal radome like that of the A-50's Shmel radar. It wasn't really an AWACS, instead being strictly a radar picket aircraft; the Baghdad-1 had fighter control links, but the Baghdad-2 did not. There were long strakes along the rear fuselage to compensate aerodynamically for the radome. Two conversions of Candid-As were performed, to be named "Adnan-1" and "Adnan-2" after an Iraqi general who had been killed in an air accident. These aircraft were said to have performed operational service late in the 1991 Gulf War. Their ultimate fate is unclear. * Although the Baghdad conversions were unsophisticated compared to the A-50, the Indian Air Force obtained Il-76-based AWACS platforms well more advanced than the A-50. These machines are fitted with the Israeli Aircraft Industries (IAI) Phalcon radar and control system. The Phalcon system is an L-band radar with a fixed phased-array antenna using electronic steering. It is regarded as "state of the art", well superior to Soviet-Russian radar systems. The IAF Il-76 / Phalcon systems are fitted with eight multifunction operator consoles with large-screen color flat-panel displays, and two electronic countermeasures / electronic intelligence operator stations. All these machines were upgraded from used Il-76 airframes. The deal was cut in 2004, with initial delivery of an order for three in 2008 and delivery of the last of the three in 2010. The IAF has considered follow-on orders. 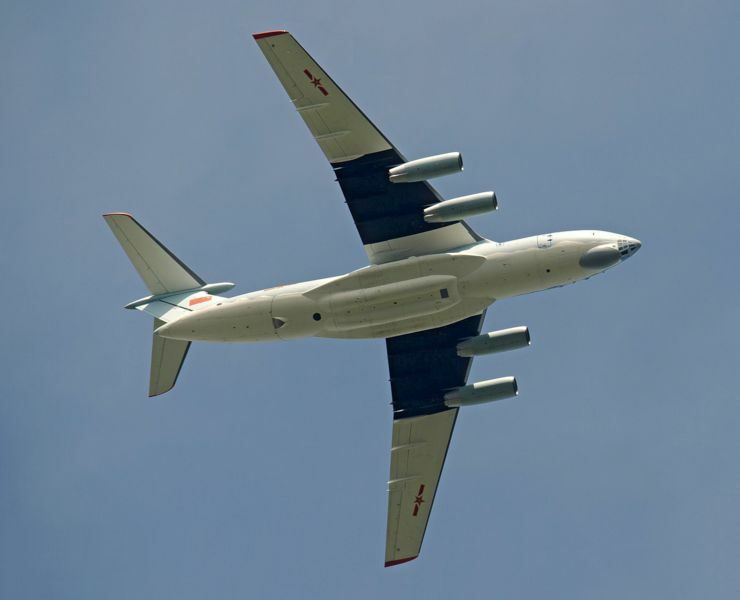 China has also used the Il-76 for an AEW platform, with the first flight of the "KJ-2000" in 2003. It looks much like an A-50, though it has an advanced "active array" radar. At least four have been built. "Ilyushin Il-78 Midas", WORLD AIR POWER JOURNAL, Volume 13 / Summer 1993, 26:27. "The Red Star Lifter: Ilyushin Il-76 Variant Briefing" by Yefim Gordon & Dmitry Komissarov, WORLD AIR POWER JOURNAL, Volume 35 / Winter 1998, 104:133.
v1.0.1 / 01 nov 08 / Review & polish. v1.0.2 / 01 sep 10 / Review & polish. v1.0.3 / 01 aug 12 / KJ-2000, new illustration set. v1.0.4 / 01 jul 14 / A-60 & A-100. v1.0.5 / 01 jun 16 / Review & polish. v1.0.6 / 01 may 18 / Review & polish.